Healthy chickpea blondies made without peanut butter that are vegan and high in protein. Easy recipe that can be made low calorie by not adding the coconut oil and reducing the chocolate by half. For the sweetener applesauce or a banana can be used. 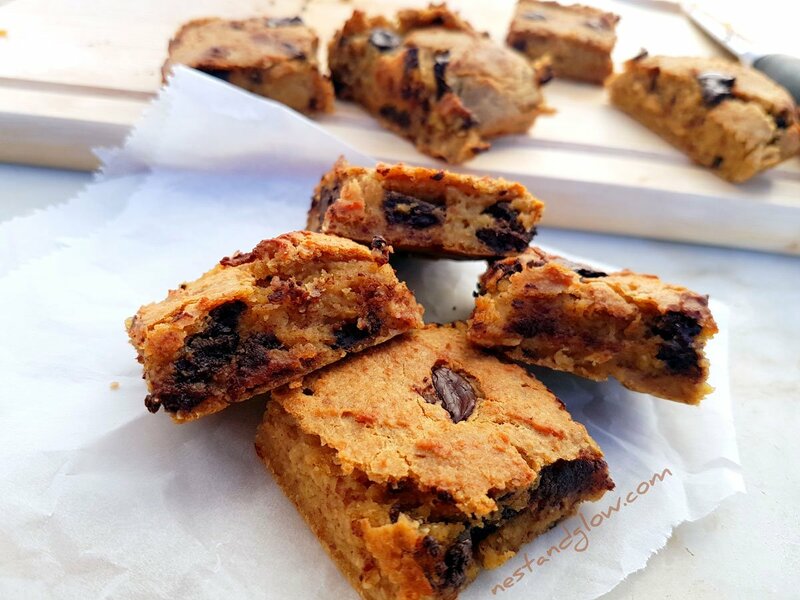 This chocolate chip blondie recipe is suitable for vegan, gluten free (make sure to use gluten-free oats), healthy, low sugar and plant-based diets. Moist and fudgy just like a normal blondie and you wouldn’t even realise how healthy this chickpea blondie is from how good they taste. Bursting with nutrition, heart-healthy fats, fibre and a few slices can count as up to 2 of your portions of fruit/vegetables. Take the chickpea blondies out of the oven just they start to get a golden colour. Don’t worry if they seem soft out – they will harden once they have cooled down. This is because the recipe is gluten-free and like many similar recipes they get structure once cooled. The healthy chickpea blondies in the photos and video were probably cooked for 2-3 mins too long. This worked out in my favour as I managed to nibble on the four corner ones that caught a bit (but still tasted delicious) while taking the photos. Often I’m spending half an hour get the perfect photo while fighting the urge to not gobble them while they are still hot from the oven. I made this chickpea blondie to use dates and whole almonds rather than almond or peanut butter as it’s cheaper and more nutritious with less processed foods. You can use peeled almonds if you in your healthy blondie but I stuck with whole almonds with the skin on to add more nutrition and it worked amazingly well. If you have the time, soak the almonds for an hour or overnight to make them easier to blend and digest. I used an 85% cacao chocolate bar and chopped into chunks to make this healthy chocolate chip blondie. The dark bitter chocolate works really well with the rest of the sweet blondie. Use whatever chocolate you prefer but I’d recommend using one with a high cacao content because it’s healthier with less sugar and high in the complex compounds of cacao. The almonds can be substituted with any nut you prefer – walnuts and cashew nuts also taste great in this healthy blondie. Peanuts can be used in this recipe if you prefer. When making this recipe with peanuts use unroasted nuts. 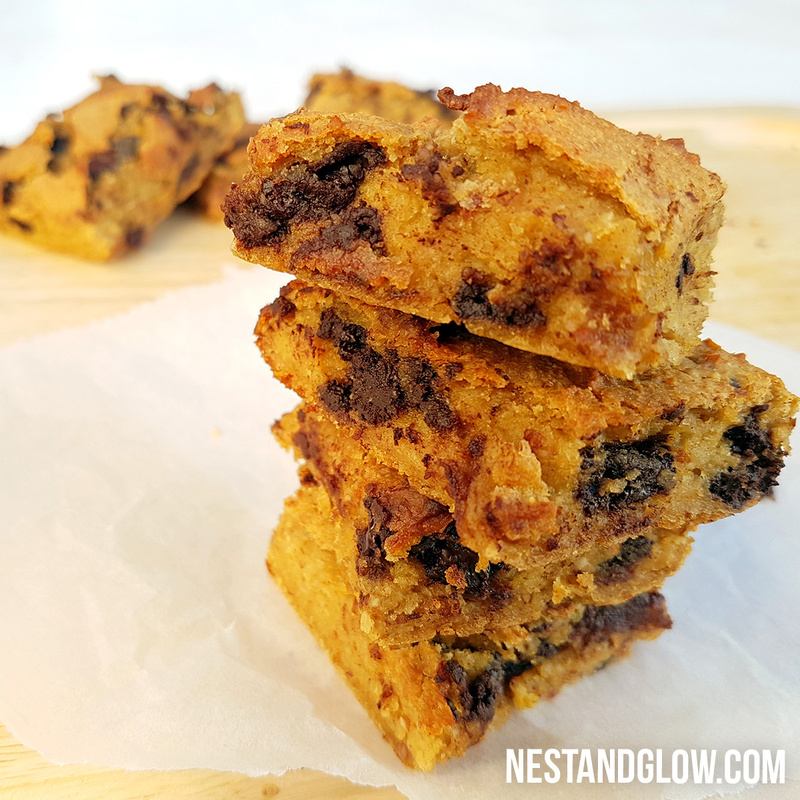 These Chocolate Chip Almond Chickpea Blondies are really easy to make, taste great and are free of eggs/milk/butter and flour. A blondie is just a lighter, in colour, brownie! Some people call these chickpea brownies. Chickpeas are a great addition to this healthy blondie recipe as they have a variety of vitamins and minerals while also being a good source of fibre and protein. Preheat the oven to 350 degrees F / 180 C.
Melt the coconut oil and grind the oats. Add everything for the healthy blondie batter apart from the water and chocolate to a food processor. Blend until smooth adding water a tablespoon at a time. Stir in most of the chocolate chips and spread onto an 8″ pan lined with greaseproof paper. Bake the chickpea blondies 25-30 mins until they are slightly golden. Add a few more chocolate chips on the top once taken out of the oven. Allow to cool and then cut into slices. Use coconut oil that is suitable for cooking, it’s often called culinary coconut oil, as it has a higher smoke point. You can replace the coconut oil with any other oil, but the taste and smell of coconut oil works well and is suitable for baking. If you want oil free chickpea blondies or lower in calories just leave out the oil. To make gluten free chickpea blondies use gluten free oats. Oats are naturally gluten free but are often contaminated during growing or processing. You can use instant oats rather than grinding normal oats. These healthy vegan blondies will last a couple of days in an airtight container. I noticed that the video included baking powder and salt, but these ingredients are not listed in the recipe above. What were the measurements for the b. powder and the salt? Thanks. Thanks for a great recipe! I would like to use non-can chickpeas, can you please tell me the non-can measurement and should they be baked, boiled or raw chickpeas to fit the ones from the can? These taste amazing. Any idea if nutritional information by chance? Hi Amanda, there is the approx calories in the recipe info – sadly I don’t have the time to work out all the nutritional information and i’m cautious at doing so as our recipes use fresh whole ingredients so its difficult to say with any good degree of accuracy. 1 avocado and 1 date can vary so much in size and nutritional composition. Great! Thank you so much! Love your recipes ???? Anything we can substitute for the Dates by any chance please? Are you supposed to drain the chickpeas or use the liguid as well. Can date paste be substituted for fresh dates? If so what is the equivalent measurement, please. Tia (thanks in advance) ☕???? Hi! You said you used dates and whole almonds instead of almond butter. If I were to use almond butter, what amount should i use? Looks yum and can’t wait to try it!!! really excellent! Loved it!! thanks so much! Can I use almond flour instead of almonds? Hi , I used walnuts instead of almonds and sultanas instead of chocolate as I don’t like chocolate. They were so good , I making more today . Oh dear. I just made these, shared them with my foodie neighbor and we are both beyond delighted. I added coconut and walnuts to the base and omitted the oil, added 2 T aquafaba in its place. Thank you Bastian. So glad I have your book. Just wanted to say a huge thank you. When I made this one recently, me and my friend simple devoured the whole thing!^^ it’s healthy, has great texture and tastes amazing. Gonna prepare it again for my family. I love recipies from your website, and appreciate this one so much. Wow Maria, thanks so much for sharing – really means a lot knowing someone has made a recipe and likes it. Hope your family enjoy it just as much!